Vintage baby picture and envelope frame, 1941. Vintage envelope style cardboard frame, 1940s. Vintage, open book style, cardboard frame, 1940s. Vintage framed picture from 1940s. Vintage baby photo in cardboard frame, 1940s. Antique baby photo from Missouri. Young Girl picture in decorative cardboard frame, 1930s. Wedding picture in cardboard frame, 1920s. Antique May family photo from Chillicothe,Mo. 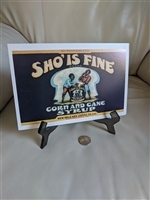 Vintage bar picture on cardboard backing. Vintage dinner photograph on cardboard backing. 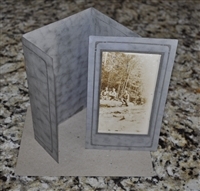 Vintage storefronts photograph on cardboard backing. Minkus Publication vintage Blank Sheets for stamp albums set of 19 in original envelope. Set of 6 postcards with 3 Justa a Note, 2 Happy Birthday, one Thank you in floral and butterflies design. Legendary Sleuths of the Silver Screen, sheet of 9 stamps by Commonwealth of Dominica framed, 1996. Cats Indians and Cowboys set of 4 cards from Leanin' Tree. Beautiful blank postcards in Old West style Cats and dogs by Leanin' Tree in set of 5 cards with envelopes.